A blessed good day everyone. We’re back ladies and gentlemen (and theydies and gentlethem); the kettle is officially singing for A Small Place and the pressure is on. We have reached the end of Week 3 of rehearsals. Before I begin, I was reading the past blogs on the Gate Theatre website and it seems like most of the blogs stop at #3. Now, I love having a soapbox eh, so if you’re reading and enjoying, I’ll need you to close your eyes, tap your ruby red slippers and ask the universe for a Blog #4. Or if that’s too much, a simple retweet will suffice. Who knows what magic we’ll get up to during tech week, wouldn’t want you guys to get FOMO. Back to business, week 3. I cannot lie, this week was rough. If one was to enter our rehearsal room at any point this week, aside from tripping over the dozens of props that keep appearing, they would be overcome by the sickly sweet scent of orange peel, ginger, lemon, honey and a slow mucus-death. Yes reader, both the director and the assistant director had been infected with the lurgy (totally Anna’s fault by the way but we believe Cherrelle was the carrier that interacted with Patient Zero). Nothing bonds a company together like a shared bottle of Echinacea and a communal orange bowl; we start Week 4 closer than ever. We have properly been getting into, what I would call, the “nitty gritty” of the play. We have run the piece in its entirety, more than once, and I’m very proud to declare that it is actually pretty brilliant (not that there was ever much doubt). We have a shape to the story now and we know what needs improvement. Remember, this is a piece that is technically based on an essay, by a very eloquent and wordy woman (who has slightly outdated ideas about Caribbean people but let me not start that one yes). The fact that we have managed to create an engaging, two-hander piece from 3 weeks of rehearsal and 30 page chunk of text, is astounding. Soon we will say goodbye to our orange-peel, lemon-ginger haven of a rehearsal room and begin rehearsals in the actual, literal Gate Theatre. This will be incredibly important because the Gate is actually, literally twice as long as the room we have been rehearsing in - so everyone’s spatial dimensions will need to update. On the upside, the extra space will allow us to fit our 100+ props (which include a life-size bust and an old hoover) and perhaps even move around the space without tripping. Very exciting, buy your tickets. Back on the soapbox for one minute, bear with me. What I love about working on this piece is that it, in a large way but still not large enough, brings to light the atrocities of enslavement and the continuing, disgusting effects it has had on the Caribbean. I’m not trying to be preachy here but I’d wager that at least 80% of you could not tell me the year that slavery was abolished throughout the British colonies (1834 by the way). I’d further wager that you were under the impression that it was the abolitionist movement by some kind-hearted white people in England (William Wilberforce etc) that ended slavery, not the thousands of rebellions, the formation of the first black republic (Haiti) or the fact that it was becoming too expensive to maintain. Here is a fact for you: when slavery ended, the British government promised to pay reparations to slave owners (yes, you read that right, not the displaced and enslaved people, their “owners”) to compensate for their “loss of capital”. Your tax dollars have been going into the pockets of slave-owners, chew on that. If this at all interests you, I’d urge you to watch Britain’s Forgotten Slave Owners on BBCTwo iPlayer, perhaps it will prepare you to experience a fraction of the rage that Caribbean people experience every day when we think about slavery too hard. Soapbox dismantled now. Jeez, these blogs get longer and longer every time. See you next time? Maybe? Hopefully? 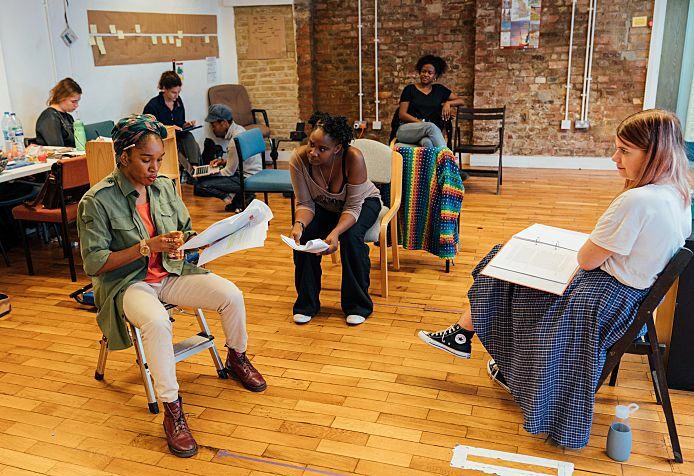 Array (  => Array ( [id] => 219 [created] => 1540824540 [updated] => 1540824540 [ordering_count] => 210 [intro] => Find out how the third week of A Small Place rehearsals went from our Assistant Director Emily Aboud [title] => A Small Place Rehearsal Diary: Week 3 [slug] => a-small-place-rehearsal-diary-week-3 [category_id] => 0 [body] => A blessed good day everyone. We’re back ladies and gentlemen (and theydies and gentlethem); the kettle is officially singing for A Small Place and the pressure is on. We have reached the end of Week 3 of rehearsals.